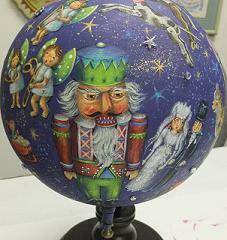 Christmas Globe" by Bobbie T.
This unique painted artwork by Bobbie T. is priced at $425.00. There are over 30 toys painted on this globe...from around the world! Shipping is an extra cost and can be arranged with Bobbie T. Arts, Inc.